Greece has pushed the European Union to the edge: The EU must deepen its union or drift apart. After the Greek crisis, the European Union will either have to deepen its union or drift apart. 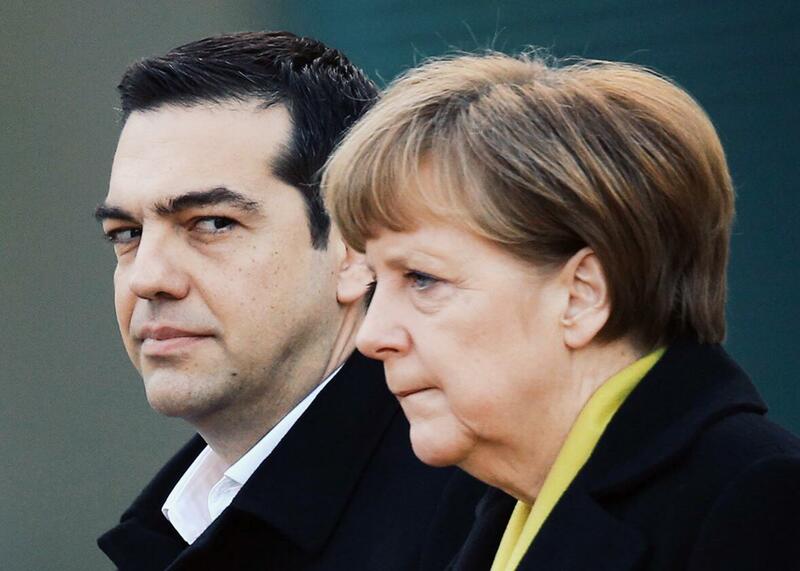 Greek Prime Minister Alexis Tsipras and German Chancellor Angela Merkel listen to their countries’ national anthems upon Tsipras’ arrival for talks in Berlin on March 23, 2015. On July 20, the government of Greece is supposed to pay 3.5 billion euros to the European Central Bank. Writing now, more than a week before that debt is due, I am loath to predict what will happen. Clearly, the government of Greece doesn’t have 3.5 billion euros. An emergency meeting of European leaders on Sunday might come up with a solution, but it might not. The consequences of a failure could include the collapse of the Greek banking system and a disorderly Greek exit from the euro currency, with knock-on effects on dozens of institutions that are exposed to Greek debt. But while I’m not going to predict what will happen in the coming days, I am going to place a much longer-term wager: The Greek crisis represents a turning point in the history of the European Union and in particular the eurozone, the European states that use a common currency. They will now either have to deepen their union—or refuse to do so and watch it drift apart. Until now, no one has wanted to make this choice. Since the creation of the euro in 1999, the members of the currency union have lived in a state of what Marxists used to call false consciousness. They have shared a currency and a central bank. But they’ve had different tax policies, they’ve run different budgets, and they’ve followed radically different economic paths. The result is that the euro has been a brilliant success for Germany and a disaster for Greece—as well as, arguably, several other countries. All of this was foreseen. In Brussels in the 1990s, one certainly met people who anticipated crises like the one that began six years ago in Greece—and who favored the common currency precisely in order to create them. The idea was that the single currency would quietly and technocratically force “good behavior” and responsible public spending on all of the governments of Europe, so that all of Europe’s economies would become stronger. Then, over time, it would become possible to coordinate tax policy, fiscal policy, and so on. There was even a moment in 2010 when it looked like this might happen. That was when the European Union and the International Monetary Fund agreed to bail out Greece in exchange for an extraordinary and unprecedented list of specific policy changes. Among many other things, Greece agreed to reduce “Easter, summer, and Christmas bonuses” of civil servants and pensioners, to raise the retirement age from 61 to 65, to use generic drugs in its health care system, to simplify the regulations on business startups. At the time, I wondered whether Greeks would tolerate such a huge range of reforms if they were perceived as “foreign,” imposed from abroad. Now we know the answer: They didn’t. The era of false consciousness is over, as is the pretense that Europe could have a successful common currency without other common economic policies. If it wants to survive, the eurozone now has to become Euroland: something much more like a federal state, or a quasi-state, or anyway an entity that shares more than the same bills and coins. This federal union, whatever structure it is to take, will have to write the rules for member states but not in an atmosphere of emergency, as happened in Athens in 2010. This union will have to be created openly, according to agreements that are well understood and agreed upon by elected governments and parliaments in advance. The rough parallel in U.S. history is the move from the Articles of Confederation to the Constitution. Those who object will have to leave, perhaps to join Britain, Denmark, and others that won’t want to be part of a European federation, though they may want to remain part of a broader “second tier” of the European Union. Just because this is what should logically happen doesn’t, of course, mean that it will—or that it will work. Indeed, the odds are against it. The euro may well stumble on, inspiring economic upheaval as well as more anti-European populism. Alternatively, the eurozone may lose a few more members—or, eventually, cease to exist at all. If nothing else, the Greek crisis—however it resolves itself—has made these choices clear.